Below are ad samples and videos from Measure 75, Wu, Sales tax hoax, Treasurer candidate Chris Telfer, Rob Cornilles, more. 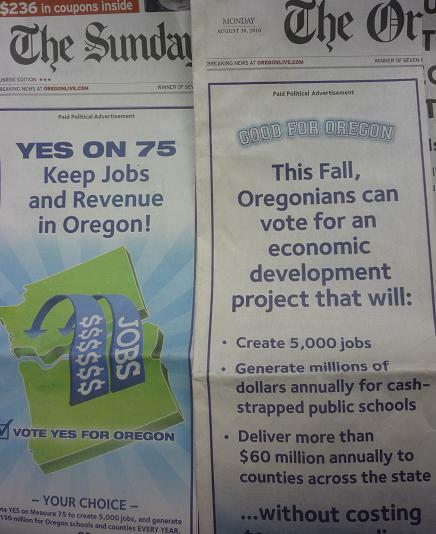 In one of the larger ad buys the Yes on Measure 75 campaign did about 5 full page front cover ads in The Oregonian over the past few months. By front cover we mean where it takes the left half of the front page of the newspaper. Below is a sample. Interestingly, these very large ads seldom mention the word casino. We heard a lot about the Democrat sales tax hoax ads they put upon Republicans who never supported a sales tax. Here is the nasty image they used in one of those pieces. 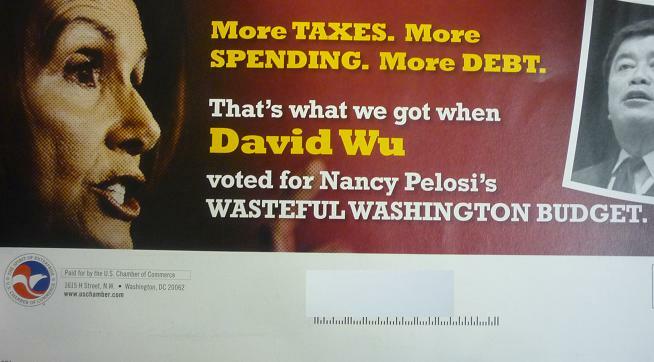 This Anti-Wu piece came form the US Chamber of Commerce, which 5 years ago would rarely have appeared in an Oregon election. But under new leadership the Chamber has been more aggressive in elections. New to campaigns are these “closer” videos where the candidate gives a closing message. Art Robinson has no video but simply put up an interesting conversation he had on the Lars Larson show.